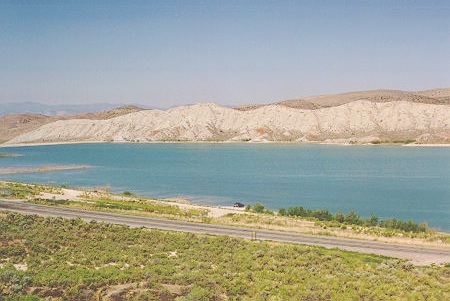 Ninemile Reservoir is an intermediate sized reservoir at the south end of the Sanpete Valley in Central Utah. It is located alongside US-89 between Manti and Gunnison, at the western base of the Wasatch Plateau. It is six miles east of Gunnison and six miles south of Manti. It is also known as Highland Reservoir. The reservoir is privately owned, but access is unrestricted. Ninemile can have good fishing for mostly recently planted rainbows with an occasional larger trout. Palisade Reservoir is close by, and if you want to go exploring you can always drive up Fairview Canyon and fish Huntington, Fairview, Electric Lake, Cleveland and several other bodies of water as well. Historical DWR records show the reservoir once had cutthroat, brown and brook trout. Also present were, fathead minnow (Pimephales promelas), and green sunfish (Lepomis cyanellus). It was drained in 1981 to raise the dam. The reservoir now is mostly a rainbow trout fishery.